The Best Western PLUS Downtown Quebec offers you the opportunity to save even more by offering you a variety of specials! Enjoy our various unique specials offers for your next getaway in Quebec City. Some of our specials are available year round and others only for a limited time. 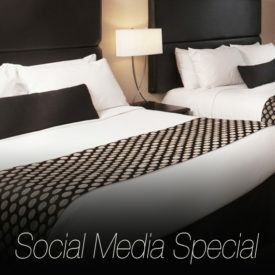 Check this site on a regular basis to ensure that you do not miss out on our best rates. Located in the heart of the Quartier Nouvo Saint-Roch, the Best Western PLUS Downtown Quebec City hotel offers high quality rooms at a low price, all in a classic and warm setting. Whether it is for a romantic getaway, a historical trip that will show you all the hidden treasures of this city founded in 1608, or a spontaneous journey through the wind, we have a promotion that will save you money by combining lodging and activities. and get a 15% discount on your stay. and get a 20% discount on your stay. get a 10% discount on your stay. Planning an unexpected trip? Our last minute special offers you specific dates at the lowest rate of the current month. In addition, we offer various activities and events that will make your stay even more memorable! only 80$ plus taxes, per night.